Apple on Wednesday announced iPhone XR, integrating breakthrough technologies from iPhone XS in an all-screen glass and aluminum design with the most advanced LCD in a smartphone featuring a 6.1-inch Liquid Retina display and six beautiful finishes as the world’s most valuable company seeks to maintain its global share and profitability. At the Steve Jobs Theatre in Cupertino, California, Apple executives and CEO Tim Cook unveiled two premium upgrades called the 5.8-inch iPhone XS and 6.5-inch iPhone XS Max. There was also a cheaper device, the iPhone XR, which is a follow-up to the iPhone 8.
iPhone XR will be available in 64GB, 128GB and 256GB models in white, black, blue, yellow, coral and Product(RED) starting at $749 (US) from apple.com and Apple Stores, and is also available through Apple Authorized Resellers and select carriers. In India, the Apple iPhone XR, XS, XS Max starts at Rs 76,900 (XR), and the release date is from September 28. Apple iPhone XS starts at Rs 99,900 for the base model with 64GB storage. It also comes with 256GB and 512GB storage options. The top-end iPhone XS Max will be available at a starting price of Rs 109,900. Both iPhones will be available in three colour options of space grey, silver and a new gold finish. It will be offered in three storage models of 64GB, 128GB and 256GB. But given the rupee slide and high import duty, the prices of iPhones will be more costlier in India, which according to a dealer will be at least by 13-16 per cent higher . Last month on August 18, Apple became the first American company to be worth $1 trillion dollars. “With the introduction of a cheaper LCD model and higher-priced OLED models, the iPhone mix for Apple is likely to drive even more revenue as it enters a refreshed product cycle,” according to the Counterpoint report. In India Reliance Jio and Airtel will support the new range of iPhones iPhone XS and IPhone XS Max e-Sim. Apple iPhone XS and iPhone XS Max will be available in India starting September 28 through Apple Authorised Resellers. iPhone XR brings the powerful A12 Bionic chip with next-generation Neural Engine, the TrueDepth camera system, Face ID and an advanced camera system that creates dramatic portraits using a single camera lens. iPhone XR will be available to pre-order beginning Friday, October 19 and in stores beginning Friday, October 26, the company said. “iPhone XR helps us reach even more people with the latest iPhone innovations. 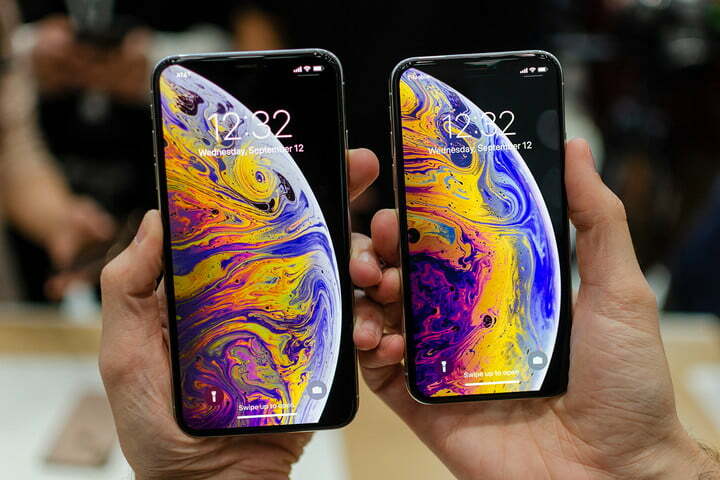 It is packed with the newest technologies including a 6.1-inch Liquid Retina display that goes edge to edge, the latest TrueDepth camera with faster Face ID authentication, new 7-nanometer A12 Bionic chip with second generation Neural Engine and a 12-megapixel camera that takes advanced Portrait mode and Portrait Lighting photos,” said Philip Schiller, Apple’s senior vice president of Worldwide Marketing. “The new iPhone XR has a gorgeous new aerospace-grade aluminum and glass enclosure that has IP67 protection from liquids and dust, long all-day battery life and comes in six beautiful finishes ”, he added. Face ID is faster on iPhone XR, enabled by software optimizations and a faster secure enclave. The TrueDepth camera system uses precision depth-sensing technology that goes far beyond the capabilities and security of two-dimensional facial scanners to unlock iPhone, use Apple Pay, gain access to secure apps and many more features with just a simple glance, the company said. Apple also announced Apple Watch Series 4 with a curved display and a large screen. Apple Watch Series 4 will show more on the Watch Face. The breathe app will now be available as a watch face.There's a new Fire, Water and Vapour Face as well for the Apple Watch Series 4. It contains custom design chips which will make it more faster and has a new chip that detects person falling. The SmartWatch will screen your heart rhythm in the background and will send a notification in case it detects an issue. It is priced between 399 dollar-499 dollar depending on GPS or LTE variant. Apple Watch series has USFDA approval for ECG recording and detecting heart rhythm.